Home > Society & Culture > Mythology & Folklore > Cashtown Inn Ghosts? Somebody told me Cashtown Inn is cursed and there has been several ghost appearances and paranormal activity. I think even pictures have been taken of the phenomenon. Where can I see pictures of Cashtown Inn's ghosts? 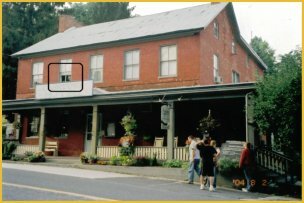 The Cashtown Inn is said to possibly be one of the most haunted places in and around Gettysburg. I was told that although they do not deny that the spirits which haunt the inn exist, they do frown upon those tourist who come in sit down and rudely say "OK show me some ghosts". 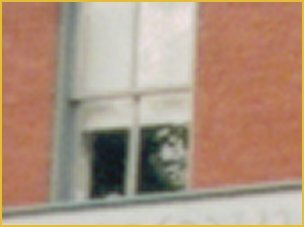 There is a famous picture of a ghost on the window. The guy who took the picture said, "We took this picture at the Cashtown Inn on our recent trip to Gettysburg. You will notice a face in the window above the Cashtown Hotel sign. My wife took the picture and swears there was no one in the window. We were only there for about 1 minute, as there were some people sitting on the porch to the right of the hotel. The face looks like a cardboard cutout to me and real fake, but I still can't explain how it got in the window for the small time we where there I have other photos of the same window taken within seconds of this one without anything in it. is this fake?" This photo is a very good example of an apparition capture! It looks like it's checking out the folks outside. Here's a video of the sounds you can hear at Cashtown Inn.